As I start to write this food post Eggplant Involtini comes to mind. Think of Tepsi Kabab bil Bethinjan as the Middle Eastern version of its classic Italian counterpart. Instead of using a cheese stuffing, oven-roasted eggplant slices are rolled around kafta kebabs. whose bottoms are not significantly larger than their tops. Kafta resembles meatloaf/meatballs in a sense that it is a mixture of ground meat, onion, herbs and Middle Eastern spices. Diced tomatoes, garlic and minced peppers could also be mixed in for added texture. Assembled pieces are arranged seam side down in a casserole dish, topped with a light or hearty tomato sauce and baked. 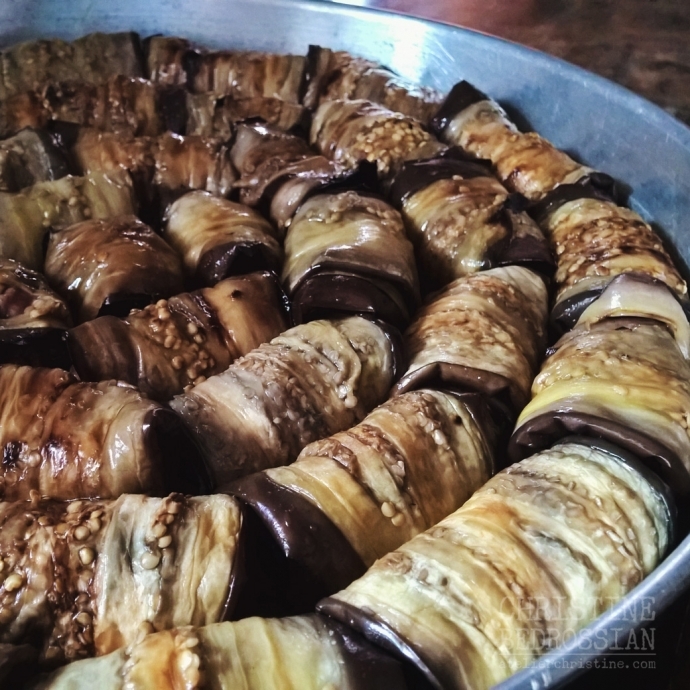 This recipe yields 48 small eggplant rolls, perfect for a dinner party. Prepare eggplants. Make sure that you buy uniformly sized and shaped eggplants, whose bottoms are not significantly larger than their tops. Thoroughly wash and pat-dry with paper towel before use. Trim the top and bottom to remove stems and leaves as well as the rounded surface from each end to flatten sides. Using a sharp knife cut each into six slices. 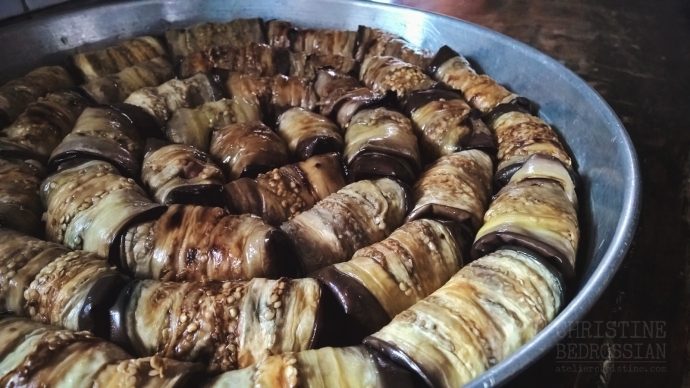 Some varieties of eggplant leave a bitter aftertaste once cooked. 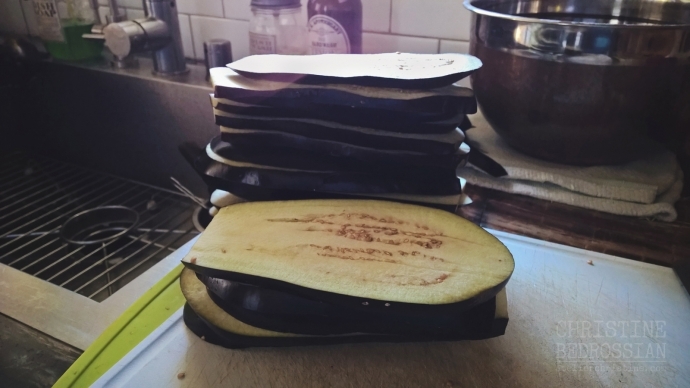 To prevent this, generously sprinkle each eggplant slice with salt and line them up on paper towels for 30-to-60 minutes – they will start to sweat. When ready, blot off excess salt and surface liquid. 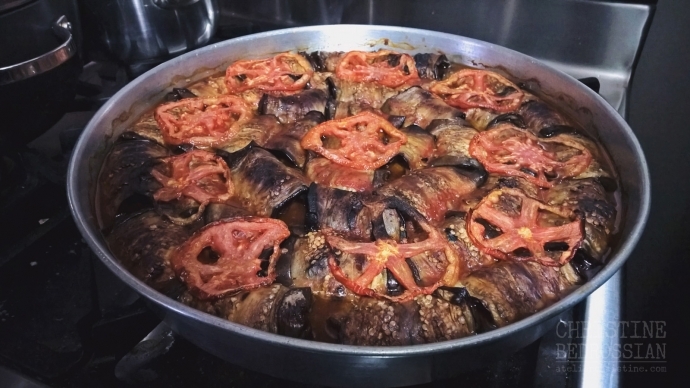 Cook eggplants. 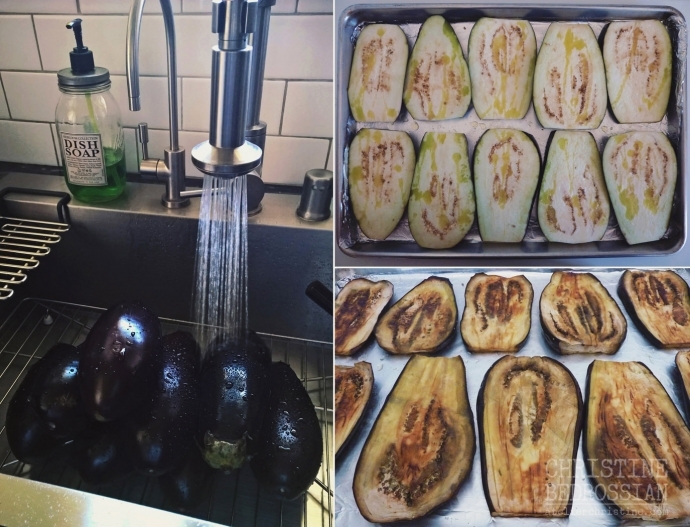 You have the option to bake, grill, oven-broil or fry the eggplant. I brush them with a little bit of oil, sprinkle on some black pepper and bake in a 375F-to-425F for about 30 minutes until softened and lightly browned. Allow to cool completely before use. Prepare kafta mince. 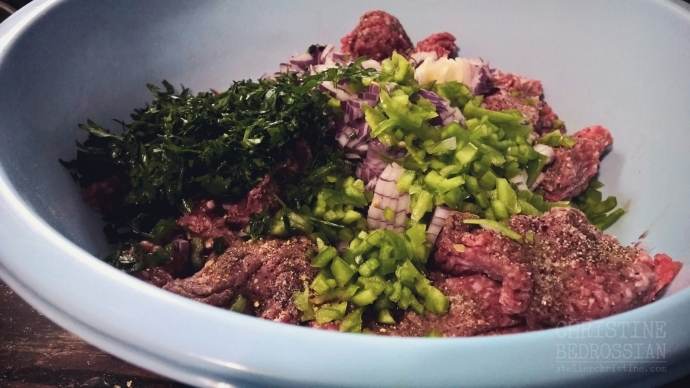 Combine ground beef with remaining ingredients in a large bowl and gently mix using your fingertips until combined. 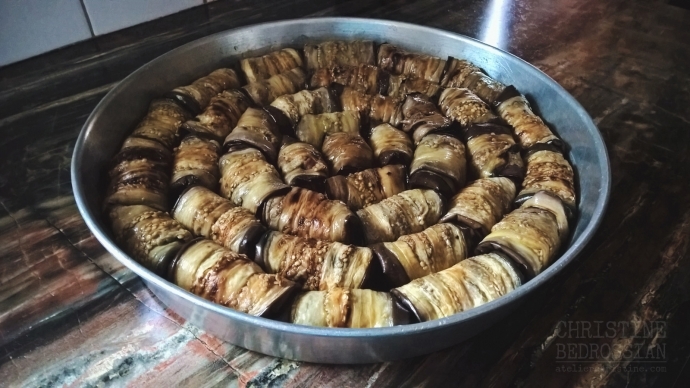 Divide mixture into 48 pieces and shape into oval logs the width of your previously prepared eggplant slices. Prepare tomato sauce. Heat oil in a saucepan until it starts to smoke. Add tomato and pepper pastes and stir-cook for 2 minutes. Add in water or stock and seasoning and gently simmer for 5 minutes before turning off heat. Allow to slightly cool to room temperature — you have the option of preparing a light tomato broth as described above or a chunky marinara-like sauce simply by adding in diced peeled tomatoes and allowing sauce to simmer until tomatoes are cooked down. Assemble dish. With narrowest ends of the eggplant slices facing you, place one shaped log on the bottom third of each slice and roll up. Arrange pieces seam side down in a rimmed pan or casserole dish — you will end up with 48 kafta stuffed eggplant rolls. Pour tomato sauce onto assembled rolls then top with tomato slices and butter. Cover with aluminum foil and bake in a preheated 375F-to-400F for 30-to-40 minutes. Remove foil and continue to bake until cooked, bubbly and tops browned to your likeness. Remove from oven and garnish with fresh parsley or basil leaves. Serve hot with rice or thick slices of rustic country bread.